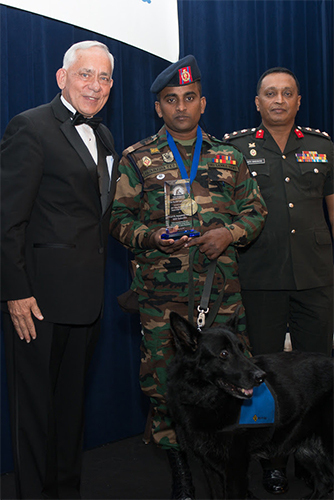 A Mine Detection Dog (MDD) Team from the Sri Lanka Army was honoured by the U.S.-based Marshall Legacy Institute (MLI) at its 20th Anniversary Clearing the Path Gala in Washington D.C on October 24. This is the second consecutive year the honour has been bestowed on a Sri Lankan mine detection dog team. MLI’s annual gala honours individuals whose extraordinary efforts have improved lives in war-torn countries and highlights accomplishments of the past year that have made the world a safer place. For their years of excellent service and the strong bond between them, MDD Yankee and her handler Lance Corporal T.K.D. Rajapaksha of the Sri Lanka Army Engineers Humanitarian Demining Unit were presented the 2017 Dog Team of the Year award by MLI’s President and Executive Director Perry F. Baltimore. The team led by Brigade Commander of the Sri Lanka Army Engineers Demining Unit Brigadier Amith Seneviratne, together with MDD Yankee and Lance Corporal Rajapaksha were recognized for their contribution and dedication to demining efforts in Sri Lanka. Receiving the award, Lance Corporal Rajapaksha thanked MLI and its partners for their continued support to Sri Lanka and sustained efforts to combat the scourge of landmines. The Marshall Legacy Institute, a non-profit organization dedicated to helping mine-affected countries, has been assisting the Sri Lanka Army Humanitarian Demining Unit in its humanitarian effort to clear landmines and explosive devices from affected regions of the country. To date, MLI has donated 30 highly trained Mine Detection Dogs to the Sri Lanka Army’s Humanitarian Demining Unit. Most of the dogs have been sponsored by generous Americans as well as global citizens, including private foundations, families and schoolchildren; several have been sponsored by the U.S. Department of State, which has also provided crucial funding support to enable MLI to train the dogs and their handlers. MDD Yankee was sponsored by schoolchildren in Greenwich, Connecticut through MLI’s Children Against Mines Programme. MDD Yankee served with the Sri Lanka Army Engineers Humanitarian Demining Unit for six years sniffing out mines and saving lives in mine-contaminated areas of Sri Lanka until retiring earlier this year. Together with her handler, she has cleared 62,680 square metres of mine-contaminated land. Today, MDD Yankee is the K9 Ambassador for the Marshall Legacy Institute and travels the U.S. with MLI, giving demonstrations at schools and other locations to raise awareness about MLI’s programmes in Sri Lanka and elsewhere. The keynote speaker at the Clearing the Path gala evening was former U.S. Secretary of State Dr. Madeleine Albright. Other dignitaries who graced the event included, U.S. Senator Mike Enzi and General (Ret.) Gordon R. Sullivan, Founder and Chairman of The Marshall Legacy Institute. In 2016 Mine Detection Dog Alvin and his handler Lance Corporal Nawarathne of the Sri Lanka Army Engineers Humanitarian Demining Unit were selected the Mine Detection Dog team of the year. 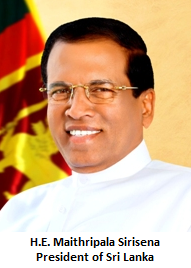 The government of Sri Lanka aims to make Sri Lanka a mine-free country by the year 2020.